Tropical Beaches and Tropical Rainforest Flowers Inspire Writer. Inspired by tropical beaches, tropical rainforest flowers and jungle clad mountains, Banfield writes about his isle of dreams. Far from lying about on tropical beaches to recover, Banfield seemed to have forgotten that he was supposed to be dying. He developed a consuming interest in natural aspects of the island, such as the tropical rainforest flowers and Great Barrier Reef animals and the energy to deal with practical means of making a livelihood, which included writing about his experiences there. He wrote articles for newspapers, so had an income sufficient for living expenses and for purchasing his boats and developing the orchard and gardens. Then, in 1908 his book ‘Confessions of a Beachcomber’ was published, to great acclaim. Translated into several languages, the book led to the romantic notion of pursuit of a tropical beachcombing lifestyle on a deserted island, by many of its readers. Michael Noonan, in his biography of E J Banfield, ‘A Different Drummer ’ (1983) tells the story of this amazing man and his dedication to an unusual lifestyle, in a very readable account of his life. Without the cheerful and practical company of Bertha and Essie, it may well have been quite different. Banfield went on to write many newspaper articles and several books – ‘My Tropic Isle’ (1911), ‘Tropic Days’1918) and, posthumously, assisted by Bertha, ‘Last Leaves from Dunk’(1923). Michael Noonan also discovered a collection of his stories which he presented as ‘The Gentle Art of Beachcombing’. One of these stories is of the sea voyage that Banfield made to England, from Townsville, heading north, inside the protection of the Great Barrier Reef, then via the Torres Straits and Batavia, an alternate route to the usual one from Melbourne and Fremantle. I think that my favourite paragraphs were the description of the ship passing through the Albany Passage at Somerset near the tip of Cape York before calling at Thursday Island. It made its steady way through a narrow channel between the pearling farms on Albany Island and the gracious family home of Frank Jardine on the mainland, children seen running about in the gardens. Jardine, who had been attacked many times by aborigines on his droving odyssey to Cape York, was a tough man, who earned his wealth from cattle, copra, pearls and, maybe, his association with pirates. He entertained with grace and elegance, such tropical traditions being presided over by his beautiful Samoan Princess wife, Sani, who, the story goes, he kidnapped from a passing missionary ship. However, despite this seemingly civilized lifestyle, his cruelty and ruthlessness had earned him the hatred of the aboriginal inhabitants of the area. 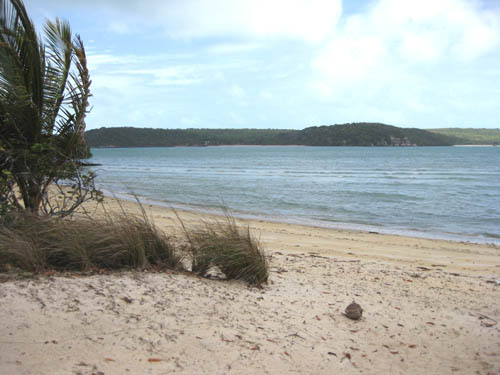 A few years ago I sat on one of the beautiful and remote tropical beaches that Banfield had described - the lovely little beach at Somerset. I visited the family’s graves, saw evidence of the ruins of their burnt house and felt the presence of these larger-than-life characters, living such wild and extravagant, but isolated lives. 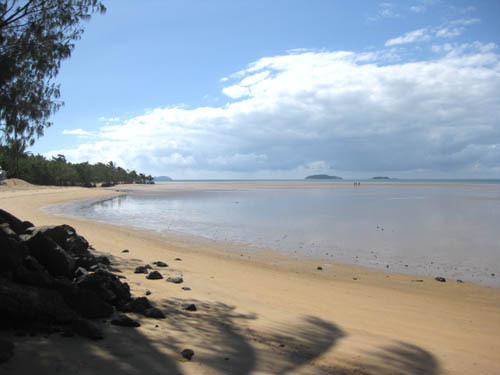 So it seems, when I visit Dunk Island, I see it through the now vanished memories of the first aboriginal inhabitants and those of Ted and Bertha Banfield, whose spirits surely still waft around in the jungle lianas and along the white beach. It was from this beach that word came of the death of Edmund James Banfield. He had died three days before his stricken and frantic wife was able to summon a passing ship by waving a sheet as it began to pass by. Fortunately, the captain thought it unusual to see just one lone figure and sent a boat to investigate. Later he buried ‘the beachcomber’ on a small rise a little way from the house and erected a stone cairn above. When Bertha died, nine years later, her ashes were also placed there. So they rest peacefully in their ‘isle of dreams’. Banfield was fond of quoting American philosopher, David Thoreau – ‘ If a man does not keep pace with his companions, perhaps it is because he hears a different drummer. Let him step to the music which he hears’ - a fitting epitaph.